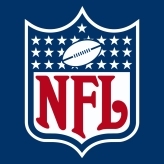 Just like our previous reports (#1 – May 17, 2012; #2 – Nov. 01, 2012; #3 – Sept. 05, 2013) the focus of this audit is strictly on the league and team websites: how they promote and integrate social media on the website. All findings are based on research of team sites on September 04-05, 2014. The Patriots had been the only team to include promotion of Vine (albeit linking to Tim Tebow’s acct, good to see they fixed that), but Philadelphia and Atlanta have added it this year. 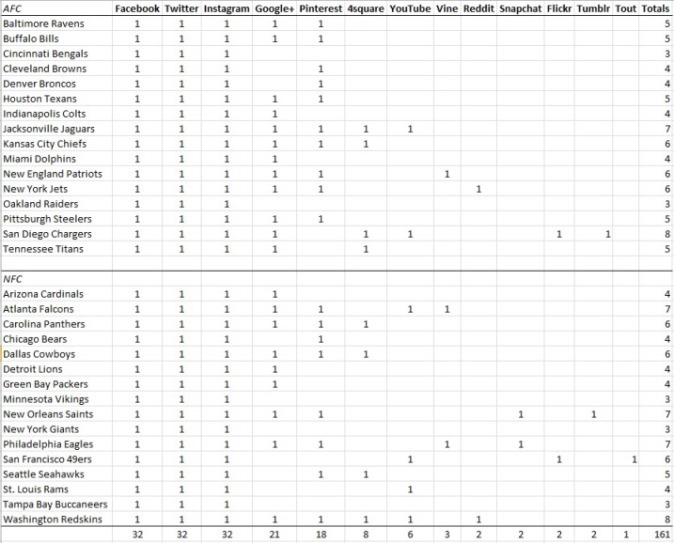 The Jets and Redskins were again the only teams to include promotion of Reddit. The Eagles and Saints were the only teams to promote Snapchat. Foursquare went down by two with removals by the Texans, and Patriots. The Chargers haven’t removed their promotion of an inactive Tumblr account (http://bolts.tumblr.com/ – last post 2 years ago), while the Saints continue to frequently update theirs (http://neworleanssaints.tumblr.com). Four teams dropped Pinterest (Cardinals, Colts, Vikings, and Rams), while the Bears were the only team to add it. Google+ added one as the Ravens and Jaguars added it, and the Rams dropped it. The Chargers haven’t removed their inactive Flickr account (www.flickr.com/photos/sandiegochargers/ – last photo from June17, 2013), but interesting to see the 49ers add it and make it first in their list of universal social media icons on their website. The 49ers still promote Tout and YouTube activations, but both are clearly inactive as they haven’t posted a Tout since February 2, 2013 (http://www.tout.com/u/49ers), and a video since August 23, 2012 (www.youtube.com/user/sanfrancisco49ers). *Interesting that the Eagles and Ravens are the only teams to use bottom-only universal footer icons. Missing an opportunity for immediate exposure in the top header area. A few teams have included social graphics for download. The Cardinals and Pats need to update their offerings. Not directly related to social media integration on the website, but wanted to callout the Packers and Redskins for including infographic pages. The Packers appear to do a better job of frequently updating theirs, but smart inclusion of content by both teams. Solid directory here by the Falcons with five categories. 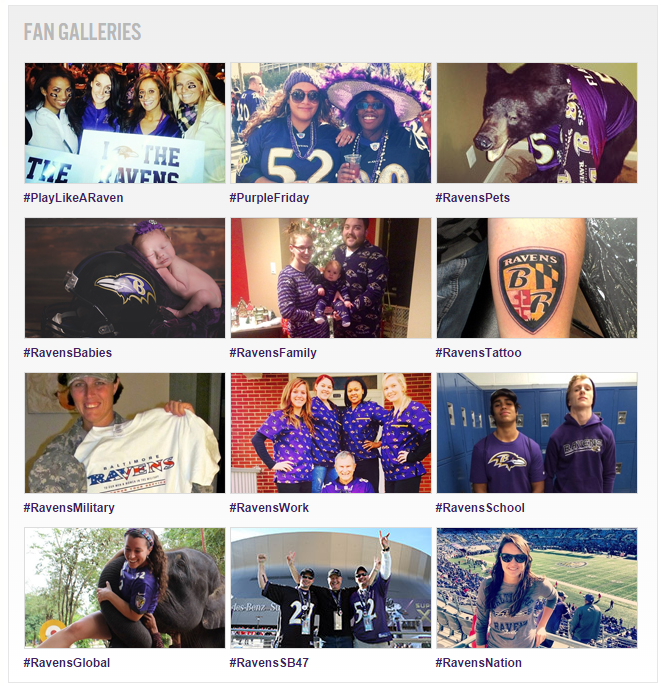 Noted this feature last year, but noticed on the page they now also include a #Ravens Instagram module. Not sure if this was strategically placed or luck of the side ad column draw, but there are opportunities for making these full page width and a more impactful visual. The Ravens do a good job with their hashtag galleries, and I like that they let fans submit photos under multiple categories. I’d go one step further and create individual game galleries too. Full disclosure we worked with the Panthers on the social content section. The Hub includes a promotional content viewer; feeds for Twitter, Facebook, Pinterest, Instagram, and Google+; Tweet #Panthers Button; Twitter Directory; callouts for Mobile, Foursquare, and Message Boards; Hashtag Gallery, and content admin. 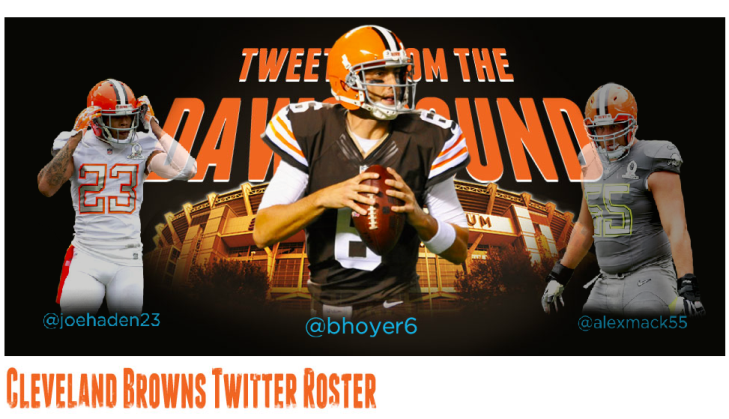 Browns have the start of a good idea including a “Twitter Roster” link in their Team section, but execution could be improved. The animation appears to come from v1 of Flash, and the feed doesn’t really help fans find out which of the players are on Twitter. 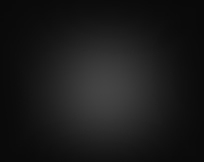 Should include a true directory along with the feed. Packers might be the only team to provide a graphical callout for their Promos account on Twitter. Well done on the promotion, and on creating the account in the first place – could provide nice benefits for fans. Similar to the Patriots example, but with possibly a better display, a value-add social directory for fans by the Jags. Interested to see if the Pats carry this through for the 2014 season, but the pats provided a curated Twitter & Instagram feed of fan photos on this page, and they also included a sponsor – Bob’s Discount Furniture. Normally not a fan of simple directory pages, because they list the main team accounts only, but in this case the Pats do a good job of listing multiple team-related accounts under most platforms which provide a solid value-add of information for fans. One addition I would add is a separate Players Directory page. The Hashtag Schedule idea is similar to the Colts and Giants, but I like that the Eagles went a step further and under the main Schedule section included an actual link for “Hashtag Schedule”. Props to the Eagles for going the extra step and promoting their accounts on Vine and Snapchat. Make it easy as possible for fans to find you. Nice job by the Eagles to showcase content from Snapchat the fans may have missed and creating a photo gallery out of it. Now they just need to include a description line about checking them out on Snapchat for more great photos. The Eagles included a hashtag link in their main header bar which goes to a separate site. The callout is a little weak and hidden actually, and there are no details on what the actual purpose is, but the site features: an incredible hype video, Tagboard feed for the hashtag, links that go back to the main site for News – Team – Schedule – Photos – Shop. 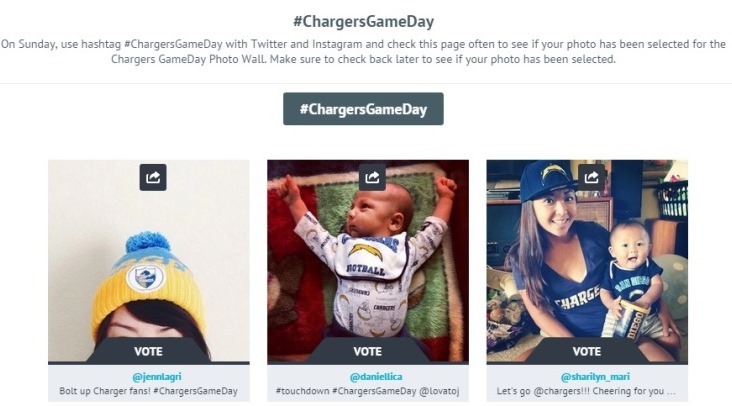 Somewhat similar setup to the Pats, but with a Voting option instead of Share – Chargers showcase fan submissions from Twitter and Instagram with the related hashtag. Much was made of the 49ers “Forty Viners” program (and rightly so), but it was very surprising to not see any promotion of the Vine channel or the program (other than the original news release) within the site. Could have been a cool content addition with a ‘Forty Viners Gallery’ for fans to browse on the site.